During the lead up to the 2016 Eurobike Cycle Show, Italian manufacturer Formula has been on a steady rollout of new products. 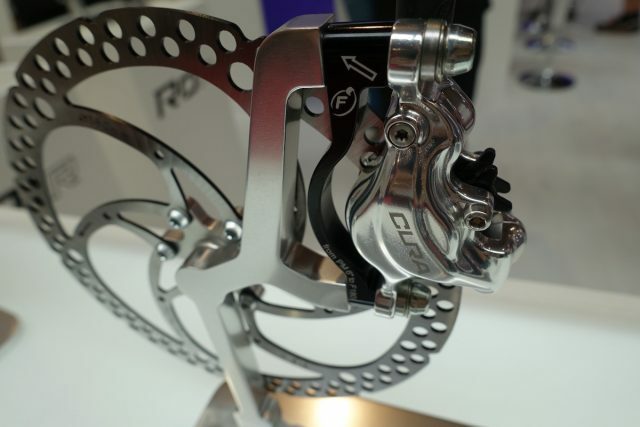 Of course Formula is likely best known amongst Singletrack readers for its hydraulic disc brake range, and so the shiny product rollout began earlier this year with the all-new Cura hydraulic disc brake. That was then followed by an ebike specific version of the Cura, which allows the ebike drive unit to recognise when you’re on the brakes so as to avoid overdriving the motor. Aside from disc brakes, Formula has been broadening its product range in recent years with the addition of suspension forks and wheelsets. Building upon the strengths of the 33 and 35 forks, last month Formula unveiled the new Selva Enduro fork, which has a lot of people talking. 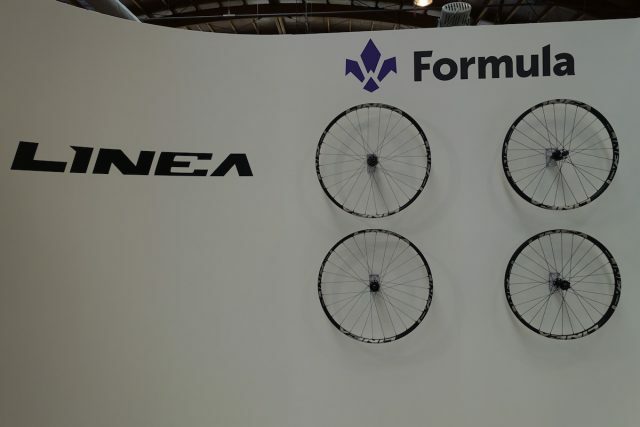 And after a brief hiatus from producing mountain bike hoops, Formula then announced a complete range of 27.5, 29 and 27.5+ wheelsets under the Linea name. 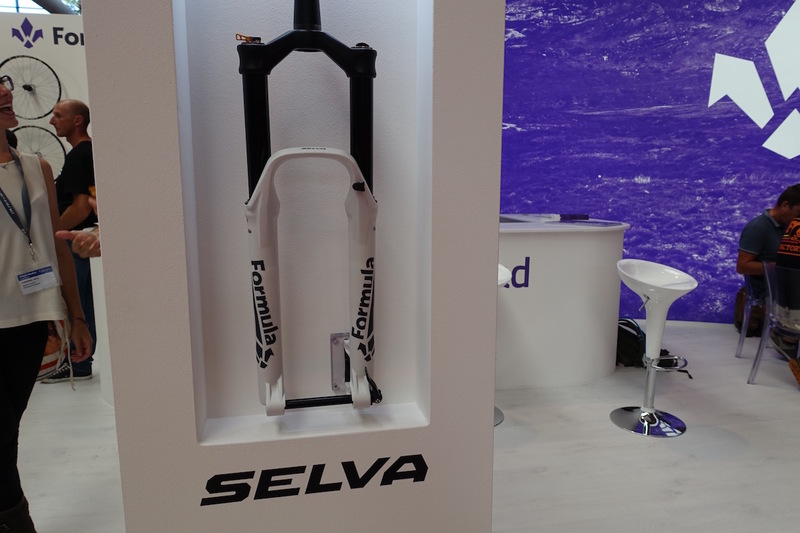 The new Selva fork was in prime position at the Formula booth, as it’s the latest suspension fork to come the Italian manufacturer. In essence, the Selva is a BOOST’d version of the existing 35 fork, but Formula have made some updates to the lower casting too. 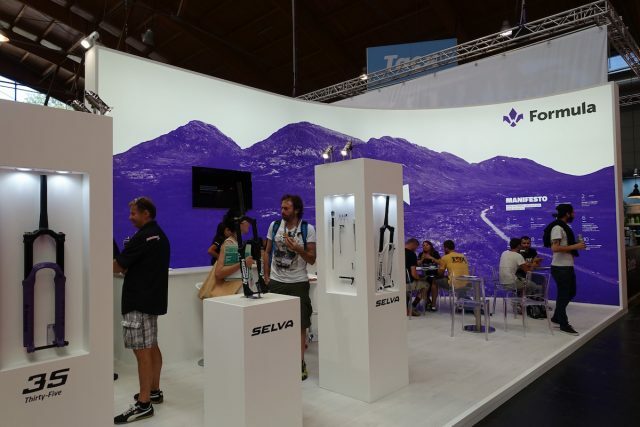 The Selva fork is available in 27.5, 27.5+ and 29 versions and offers between 120-160mm of travel. There’s also an ‘Extended’ version of the 27.5 size, which pumps up the travel to an enormous 170-180mm. 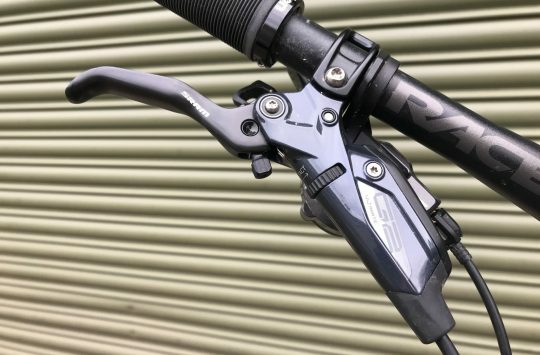 Overall, it’s built to be a smooth and highly capable suspension fork for endoooooro racing and riding all of the mountain. 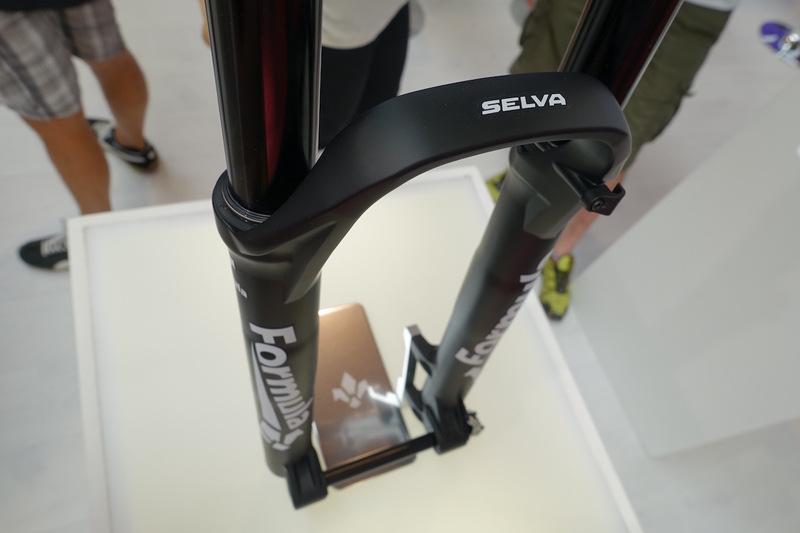 Like the 33 and 35 forks, the Formula Selva features the distinctive external damper control unit on the top of the right-hand fork leg. Inside is a drop-in hydraulic cartridge, which has been designed as such to offer ease of removal and servicing. As for the Swiss watch on top of the fork, the gold lever is the lockout, the blue dial controls low-speed compression damping, and the black adjuster allows you to control the lockout force. 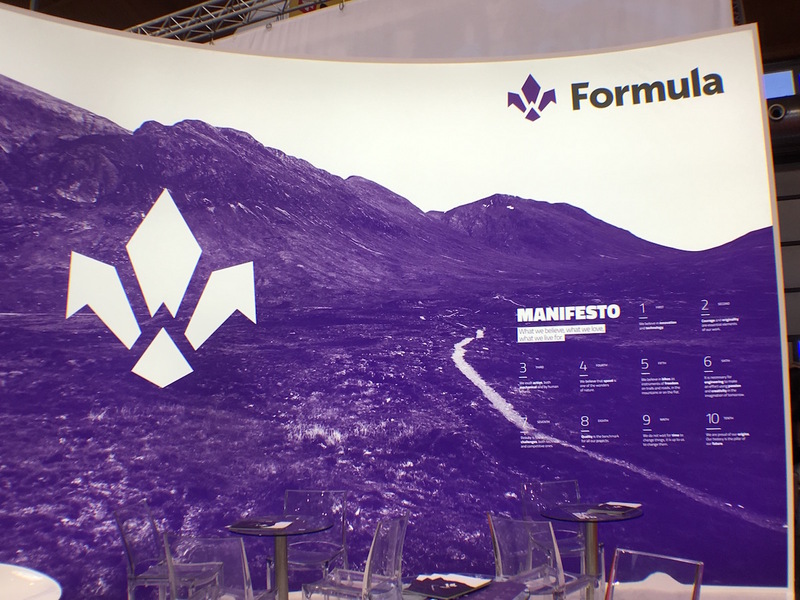 Formula had some fork guts on display to show us what lies beneath the shiny exterior. On the left is the drop-in damper cartridge, which uses an expandable bladder much like Fox’s FIT damper and RockShox’s Charger damper. On the right is Formula’s unique hybrid spring system, which employs a negative coil spring and a starter coil spring to help ease the fork into its travel. 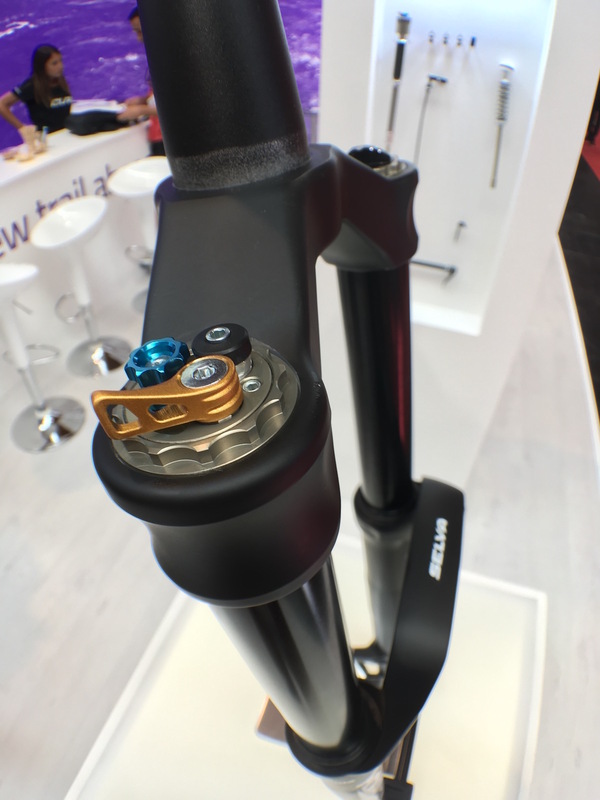 The Selva, 35 and 33 forks all use this hybrid spring system, with the positive chamber being adjustable via a schraeder valve at the top of the fork. 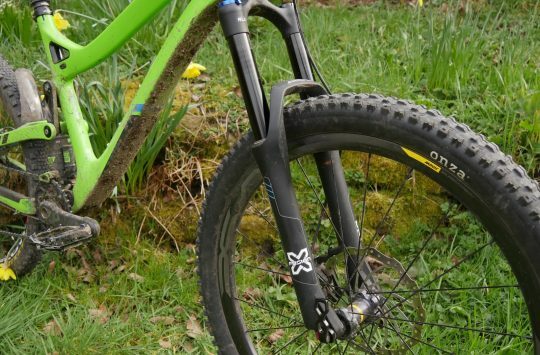 The primary seal head for the spring also uses a floating ball head, which allows for a slight reduction in stiction when the fork is sliding and flexing. Flex through the lower legs can otherwise twist the internal spring shaft, so this is Formula’s solution to ensuring everything stays sealed and smooth inside. 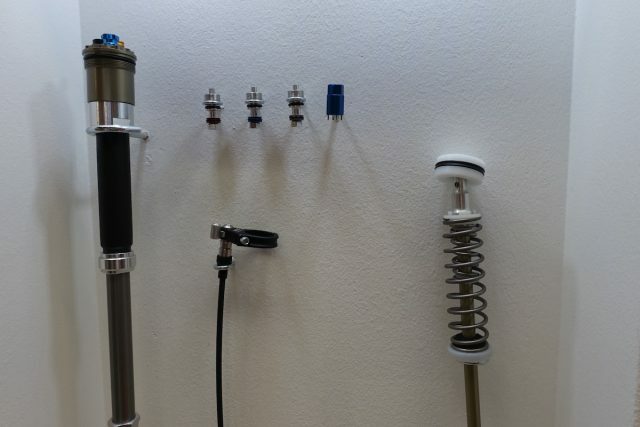 Further adjustability comes from Formula’s Compression Tuning System. There are three different shim stacks that are arranged into individual modules that can be swapped into the fork. They sit underneath the blue adjuster dial, and allow you to fine-tune the high-speed compression of the Selva, 35 or 33 fork. The Formula 35 fork continues on into 2017 as the regular (non-BOOST) version of the Selva fork. 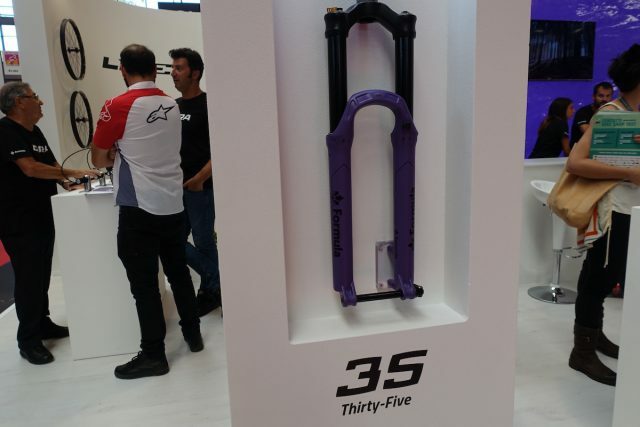 Like the Selva, the 35 features 35mm diameter stanchions, and features the same internals with the hybrid spring system and drop-in damper cartridge. 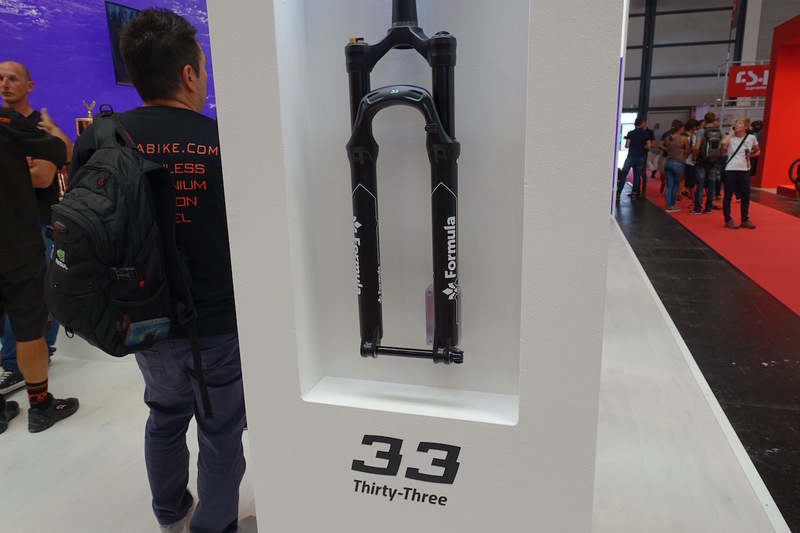 The lightest option in the range, the Formula 33 fork shrinks the stanchion diameter down to 33mm (no prizes for guessing that one!) and lightens the chassis to make it more suitable for XC racing and trail riding. 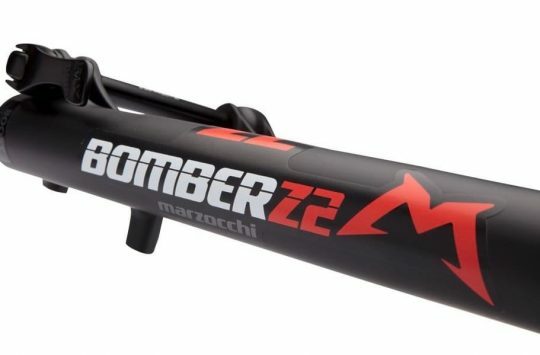 It’s also available in 27.5in and 29in sizes and offers 100-140mm of travel. Claimed weight for the lightest option is just 1580 grams. You will have already read/seen/used the Formula Cura brake before, as it has been available for a little while now. However, this shiny version had our shutter finger getting all itchy. 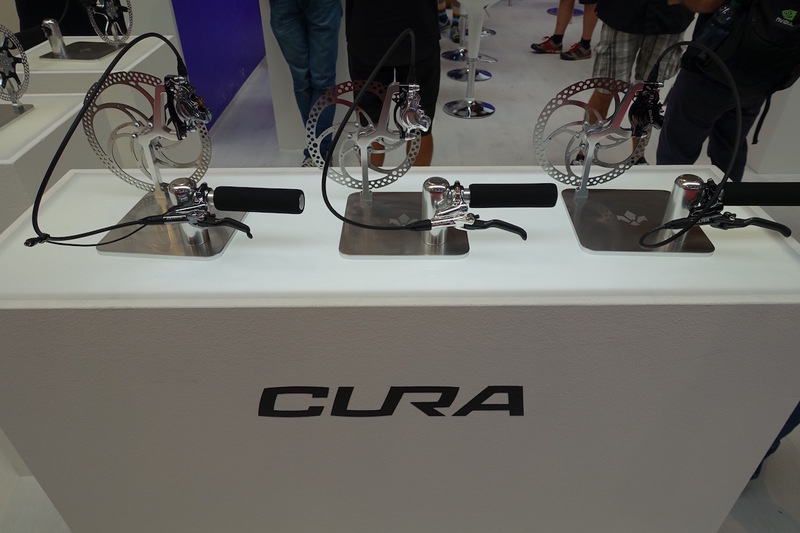 The Cura brake has been designed for a wide variety of riding styles in mind. It’s got big 24mm diameter pistons for the caliper, which has a lovely 2-piece construction and post-mount brake tabs. 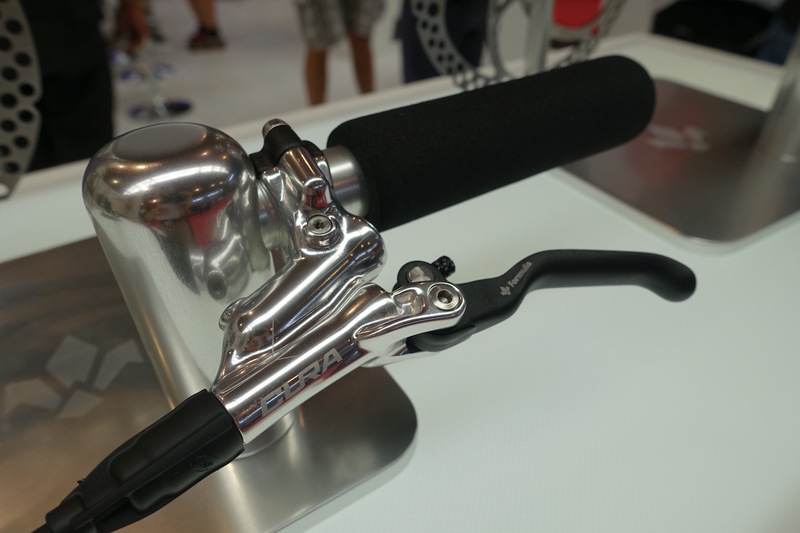 Formula have shifted to Mineral Oil for the Cura brake, and it also comes with Formula’s clever SpeedLock system that allows you to disconnect and reconnect the brake hose without need for bleeding. 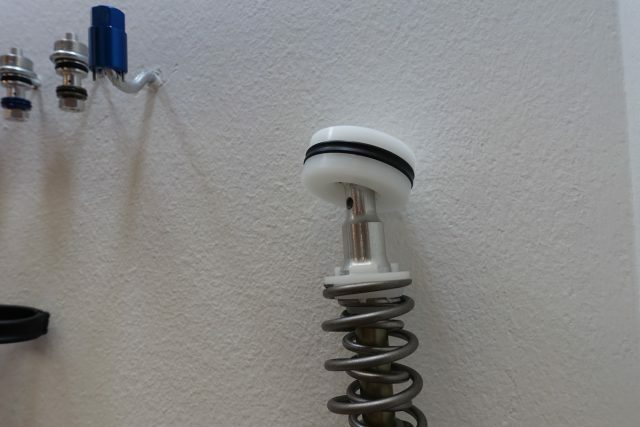 If you do need to bleed it, there are multiple bleed points in the lever so you can get rid of any pesky air bubbles. 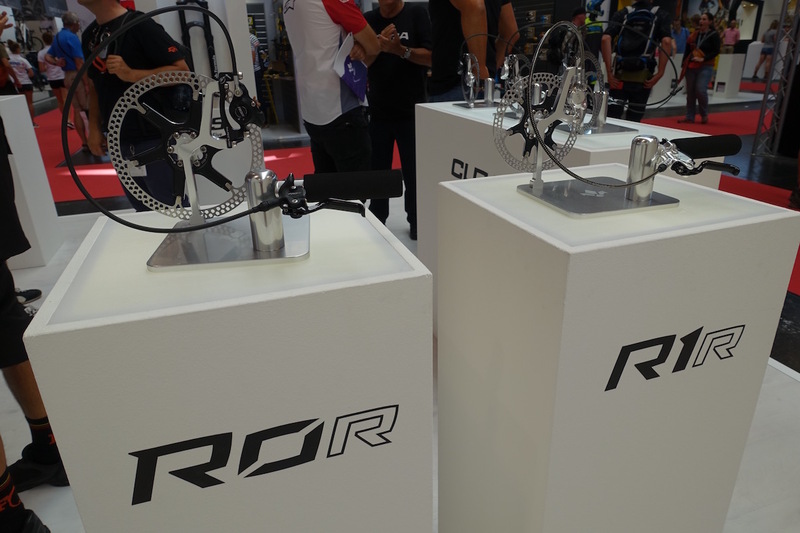 In addition to the Cura, Formula are still producing their higher-end ROR and R1R disc brakes too. We’ve already covered off Formula’s new Linea wheel range in a separate article, but Eurobike was our first chance to actually see the wheels in the bare metal. 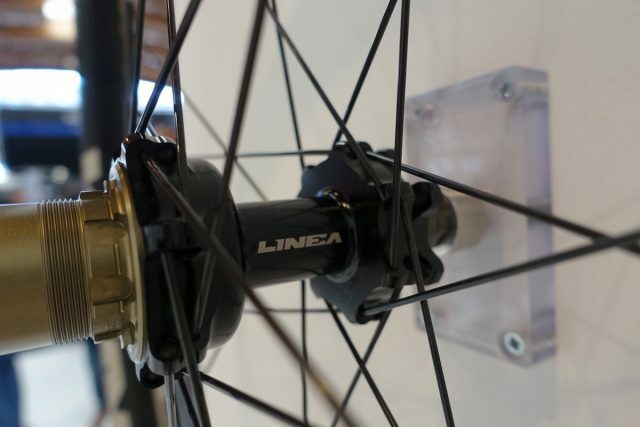 The Linea wheels are built around Formula’s own hubset that features sealed cartidge bearings, CNC machined hub shells, and a unique loading system for the drive-side bearing that helps to widen the overall bearing stance for the rear hub. 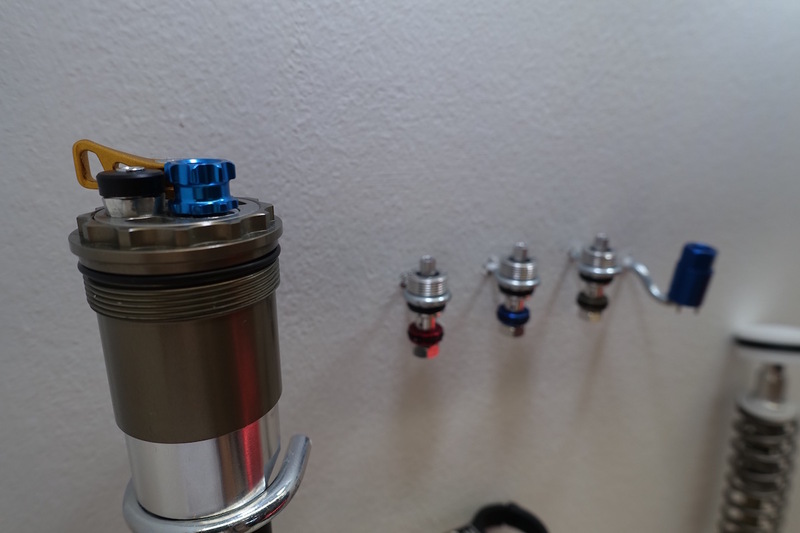 Inside the freehub is a 4-pawl system that delivers 60 engagement points for prompt pickup. 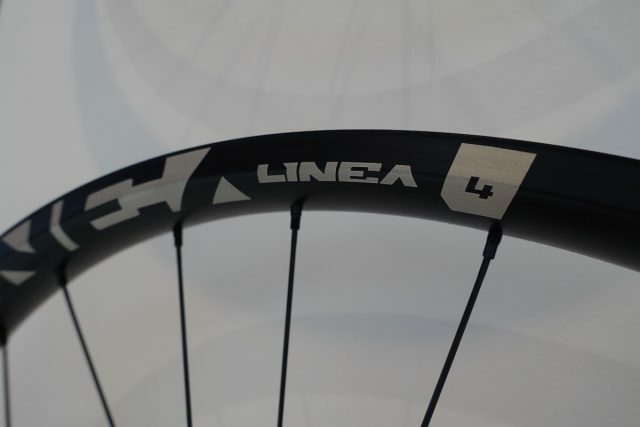 The Linea rims use a hookless rim profile that is tubeless compatible and built from 6082 T6 alloy. There are three different internal width options available: 27mm, 30mm and 40mm. The lightest option available is the Linea 2 wheelset, which comes in at 1356 grams. 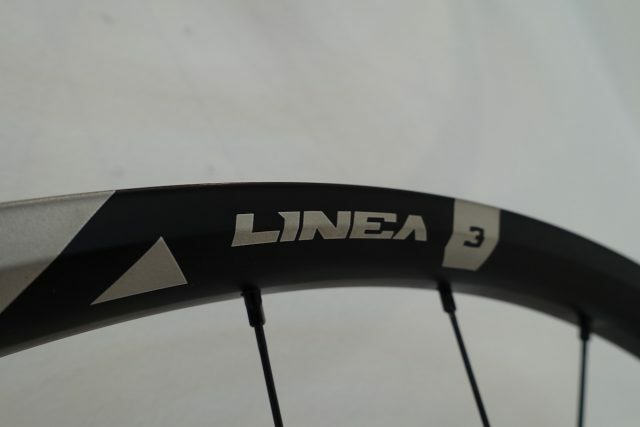 Shown here is the 30mm wide (internally) Linea 3 wheelset, which comes in at 1636 grams for the 27.5in diameter, and 1803 grams for the 29in option. The widest of the lot, the Linea 4 wheelset is equipped with a 40mm internal rim width that suits plus tyres between 2.8-3.7in wide. All of the Linea wheels are available in a variety of different hub axle options, and you can get them with a Shimano or SRAM XD driver. Does that mean they’re stopping producing the R1 etc and just offering the Cura, R1r and R0r?